Does super premium pet food have to come at a super premium price? When you buy big brand, big name petfoods, you pay a big brand price! WHY CHOOSE ANIMAL ANTICS? We are different. Just the good premium food in a simple bag with a simple label. Our advertising is purely through the internet website and through customers recommendations. Wheat gluten free a nutritious food which provides all the essential nutrients required for active, healthy adult dogs. There are no artificial colours or flavours, which are often the source of chronic skin irritations and hyperactive behaviour. 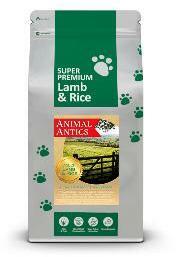 A complete food with lamb as the main protein source  an ideal alternative for dogs with a sensitivity to chicken or beef. More for Less. When comparing pet foods – always read the label. The super premium range is proud to declare named meat sources (turkey, lamb, chicken) and quality digestible carbohydrate sources such as rice and potato – proven hypoallergenic ingredients.